In a blog a few years ago, I began a spring cleaning of my comic-book collection. With some comics dating back to the 1970s, I hoped to organize and inventory a collection that until now had been stored in boxes haphazardly over the years. I must admit it has been slow-going, but it has been interesting going through the boxes periodically. As one can imagine for a collection that goes this far back, there are a lot of items I don’t recall. I also had a surprising number of “orphan” first issues from both regular and limited series that I obviously did not continue buying or collecting. It's been gratifying to be able to consolidate issues of a series together from across several boxes, especially if they completed a limited series set. I have full or nearly-full runs of the original Love and Rockets, the original Spirit magazines that were published by Warren Magazines and Kitchen Sink, and the first original runs of open-ended and limited comics series like American Flagg!, Bone, Micronauts, Longshot, the Dark Knight Returns, Batman: Year One, Camelot 3000, Lowlife, and Eightball; as well as industry magazines like the Comics Journal (I have nearly a complete set of the more than 300 issues have been published to date), Amazing Heroes, Comics Interview, etc. I also have a lot of Batman and Detective Comics from the ‘70s to the present. Akira: Though a few volumes of this 38-volume set are still missing, I expect the rest will surface after I have had a chance to go through my remaining boxes. This series was brought to the U.S. by Marvel Comics beginning in 1988 and played an important role in bringing anime and manga into the American mainstream. Though the series has since been reprinted by other publishers in the U.S., Marvel’s was released in handsome full-color squarebound volumes. 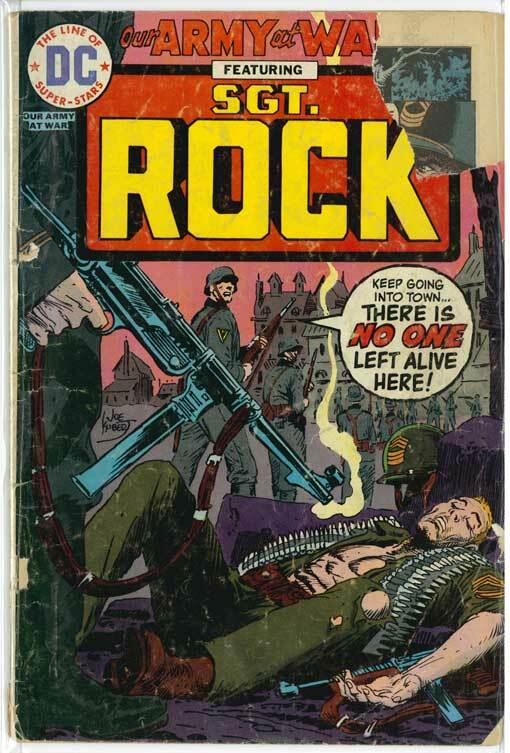 I believe this series is among the first ever in the U.S. to be colored digitally with a computer; it is beautifully colored and no doubt opened the eyes of many in the industry. I’m finding a lot of early work by people like Mike Golden (in an issue of Batman Family), Frank Miller, and Chris Sprouse. Other comics I haven’t come across yet but expect to find eventually include comics I followed fairly regularly while in junior high school and extending through my college years and after, such as John Byrne’s run on the Fantastic Four and his subsequent re-boot of Superman, the run of the X-Men when Paul Smith was the artist (the only time I was a regular reader of the series), and the original run of Watchmen. I also likely have all the souvenir programs from the San Diego Comic-Con dating back to the mid-1980s. I have to admit, I've begun thinking of ways to unload the collection. There are some series I likely will hold on to for sentimental reasons (including the titles listed above, but the rest I have very little interest in holding on to! A few years ago, I stumbled across this amazing resource called the Internet Archive Wayback Machine that appears to archive past versions of websites. As good as I think I’ve been in preserving the history of my comics work, the dynamic quality of the web makes it less easy to do this. So this has been a fun tool for looking back at how my website (and my web design and html/css skills) have evolved over the years. 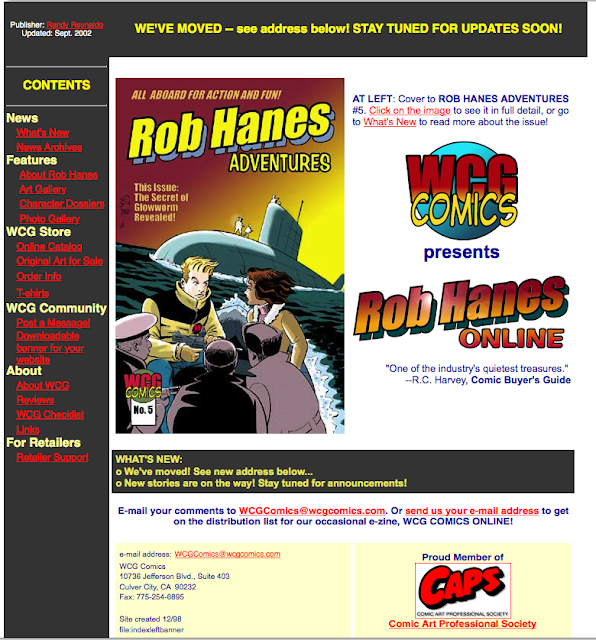 If you visit the overview of the WCG Comics website here, you’ll find snapshots taken of the website on various dates throughout the year from the year 2000 to the present. I was particularly impressed to see that these are not simply screen images, but the full functional website, live links at all! Below are some sample pages for the site that you can click through to explore. For an overview of all the available pages from past versions of the website, click here. For more, visit the Internet Archive Wayback Machine! 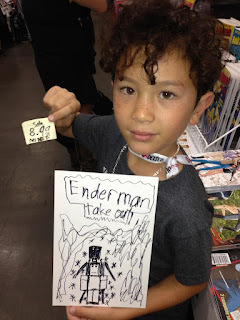 Earlier this month, I spent a day and change checking out the San Diego Comic Fest with my family. The Comic Fest, held Oct. 4-6, debuted last year and was founded partly as a counterpoint to the behemoth that the San Diego Comic-Con has become. For some, the size and media frenzy surrounding Comic-Con has had a negative impact on the fan experience and pulled the show away from its comics roots. Indeed, the Comic Fest was founded and organized by many people who were involved with the original Comic-Con since its earliest days. 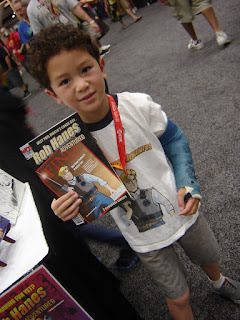 I became aware of the show last year at the San Diego Comic-Con when its organizers were promoting the first Comic Fest. First let me say that I have never begrudged Comic-Con’s growth over the years. Change is an inevitable part of life (you can indeed never go home again!) and, having attended nearly every show since the mid-1980s—and exhibited at nearly half of those—it has been fascinating to watch Comic-Con morph from fairly humble origins to its present position as the largest and, certainly, most influential such pop culture celebration in North America. Though the show is indeed very different from its early days and, yes, overwhelming, I’ve always taken comfort in the fact that other “old school” conventions still exist in other parts of the country. I recall those earlier Comic-Cons fondly, noting that back in the day the biggest celebrities at the event were people like Clayton Moore and Noel Neill from, respectively, the original Lone Ranger and Superman television shows. So props to the organizers for putting together a show to their liking rather than bemoan what Comic-Con has become. The Comic Fest is intended by design to be a much smaller event (indeed, attendance was capped at 1500) and capture the spirit of the original Comic-Cons which gave fans an opportunity to mingle and speak with comics fans and creative professionals in a more relaxed and social atmosphere. The show was held at the Town and Country Hotel and Convention Center in the Hotel Circle area of San Diego. The Town and Country also is an official hotel during Comic-Con (as are most of the hotels in the area) and is sited a few miles away from the San Diego Convention Center where the Comic-Con is now held. During the 2012 Comic-Con, I was one shuttle stop from the Town and Country, so though I had never been inside, I was familiar with it. According to Town and Country’s website, the family-owned resort opened in 1953 and I must say it certainly showed its age—to be kind, the facilities are well-worn and do have the feel of another era — which made the venue, in its way, perfect for the kind of show the organizers planned, harkening back to Comic-Cons decades ago. Like most comics shows, the Fest consisted of a dealer’s room, an artist’s alley and panels. They also had programming directed at families/all ages. I have to admit that, partly because of my own inherent shyness, I have never put much emphasis on the social aspect of comic-book conventions. Having said that, it was nice to speak a bit with some of the artists and catch up in a more relaxed atmosphere with fellow pros like Batton Lash, Jackie Estrada, Michael Auschenker, and Ken Meyers, Jr. Personally, the highlight for me were the panels. I have mentioned in past reports of Comic-Con that I seemed to have lost patience in sitting through most panels—I’ve always presumed it was a simple aspect of getting older, but I guess it’s just a result of the Comic-Con atmosphere. The fact that I have other things on my mind (i.e., guilt that I should remain at my booth), the stress over possibly being unable to attend a panel due to overcapacity, the crowds, and the impersonal (and sometimes corporate) nature and sheer size of the panels have likely all contributed to this feeling. The Schanes Brothers’ Story: From Swap Meets to Pacific Comics: Working independently but in parallel with others across the country, Bill and Steve Schanes helped establish the modern-day comics distribution network and opened some of the earliest comic-book stores. They also founded Pacific Comics, one of the first independent comics publishers to operate in the fledgling direct-sales market, which first published, among others, Jack Kirby’s Captain Victory and Dan Stevens’ Rocketeer. Like many such pioneers, they demonstrated an entrepreneurial bent at an early age (at least one of them was still a minor when they got into business) and learned the business, flying by the seat of their pans, as they went along. The brothers shared their fascinating story as direct-sales and indie publishing pioneers in a conversational, entertaining, funny and self-effacing manner. While some may be tempted to look back on those days with nostalgia and fondness, their stories show that the opening era of the direct-sales comics market was a true Wild West as entrepreneurial types moved in as they realized there was money to be made on filling an unmet need. The Schanes talked—with some humor in hindsight—of the rather unsavory underworld types who ran the early days of the comics and magazine distribution system. (At one point, Bill Schanes talked about getting his four automobile tires slashed every day for two weeks as a company tried to convince him to do business with them.) And even during what some might believe was the collegial, chummy world of comics fandom, they described their experiences dealing with strong-arm tactics and behavior. The Secret Origins of IDW: IDW, based in San Diego, celebrates its 10th year anniversary this year and marked the occasion with this panel hosted by IDW CEO and Publisher Ted Adams, who, as he spoke, introduced various members of the publisher’s leadership team to talk about the company’s various areas of focus. 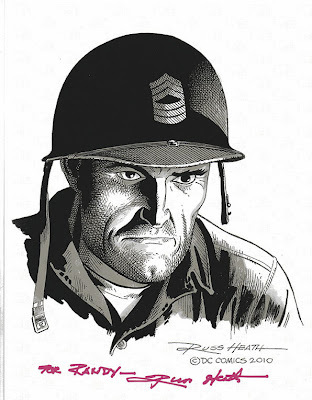 My main familiarity with IDW is through their American Comics Library imprint, through which they have published several fine collections and overviews, including those I’ve reviewed focused on the life and art of Alex Toth and Milton Caniff. So it was interesting to hear their history of getting into comics—which was never in the company’s original business plan—through both creator-owned properties and licensed characters like Transformers and G.I. Joe. A special treat was the free book they provided to attendees at the panel, which came in an impressive slipcase. The book consists, I believe, of the covers to all of the comics they have published to date. They also announced that IDW was entering the tabletop games arena. Though the discussion touched on the Disney's film, Song of the South (which is not available domestically) and the issues of race in animation, it was also an opportunity for Beck (and the audience) to ask about and be regaled by stories from the glory days of animation by two men who were there. Their comments about Walt Disney were especially instructive—Disney’s alleged anti-Semitism and his politics often arise when he becomes the topic of discussion and, as I have heard Norman do in the past, he dispelled these rumors through his sharing of personal anecdotes and experiences, delivered as always in his gracious and balanced manner. As anyone who has seen the knowledgeable Norman speak, he is no apologist—Norman is always clear-eyed and candid with his thoughts and opinions, which along with his very easy-going manner, makes him a very credible and entertaining source. I enjoyed the Comic Fest though I’m not sure I would attend this annually (esp. since I also attend the San Diego Comic-Con). Though nostalgia for the comics of one’s youth has always been a part of the Comic-Con experience, the Fest seems a bit more steeped in it, as opposed to highlighting what is the now and new in comics. This is not a bad thing, but it certainly is something potential attendees should consider when planning to attend any kind of comics show. Every comics convention has its own personality and focus—Comic Fest yearns for a simpler time when the convention was more relaxed and there was less of a barrier between fans and pros, which the sheer size of Comic-Con has made necessary. For anyone wishing a more relaxed show and a taste of the early days of Comic-Con, Comic Fest is certainly worth a visit. Next year’s show is scheduled at the same location, Oct. 17-19, 2014. BELOW: Trailer for Saving Mr. Banks. As I’ve mentioned in previous blogs, my purchase last year of a Kindle Fire HD tablet has re-introduced me to the pleasures of reading comics. While I continued to purchase comics on an occasional basis in support of my longtime local comic-book store, I actually read few of them due to lack of time and general disinterest. However, the novelty, ease and instant gratification of purchasing and reading comics on the Kindle (primarily via Comixology)—along with the benefit of not having to worry about accumulating comics that have to be stored somewhere—has led to my reading and checking out some new comics. And in the same way that “binge-viewing” on Netflix and other websites has become a popular way to watch television series, “binge-reading” comics is also a lot easier if I have missed earlier issues of an ongoing story. I’ve never been a “DC versus Marvel” kind of comics fan, but having said that, the majority of the comics I’ve read from the Big Two have probably been from DC. As a traditionalist and student of comics history, I’ve always had a special appreciation for the grand-daddies of superheroes, Batman and Superman. 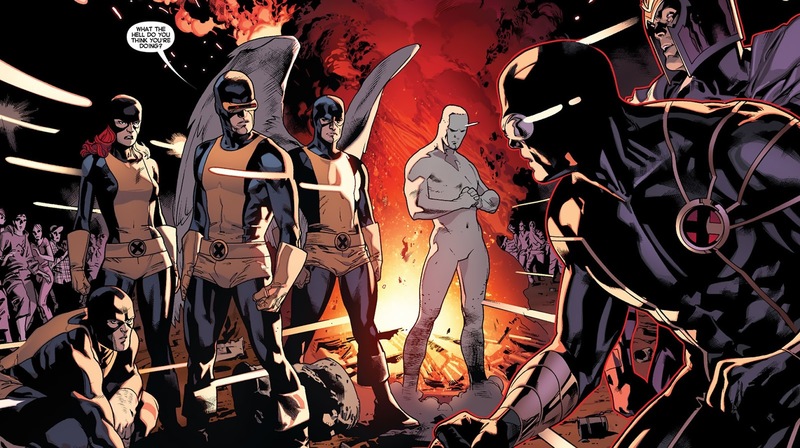 But there have also been Marvel titles I’ve followed, most notably the Uncanny X-Men when Paul Smith and Chris Clarement worked on the series in the early ‘80s; John Byrne’s run on the Fantastic Four around the same period; and Frank Miller’s work on Daredevil (also around the same time!) which put the artist on the map. Though story is important, like a lot of people, I won’t look at a title unless I find the art just as compelling. Well, pendulum has swung back because at the moment I noticed that a lot of the comics I’ve been reading and enjoying are by Marvel. Over the past decade, the Big Two have made it notoriously difficult for casual comics fans to read their main titles because of the level of multi-issue story arcs that can cross multiple series and take up to a year or more to play out. Even after DC’s much lauded “New 52” where they essentially re-booted the series, the storylines have remained convoluted, complex and confusing for many casual readers. In addition, I have found many of DC’s books to be over-rendered in art, story and coloring, making it unappealing and a bit of a muddy mess to look at; in contrast, Marvel doesn’t seem to take itself quite as seriously, meaning there still is a level of inherent fun in their comics that seems missing in many of the DC’s I’ve picked up. 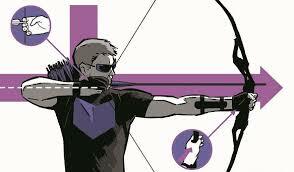 Hawkeye has never been on my radar and mostly existed as a second-tier character. The character’s appearances in the recent Marvel films, first as a cameo in the first Thor film, followed by a respectably significant role in the Avengers (as played by Jeremy Renner), no doubt raised the character’s profile for both the geek crowd and a general audience, presumably leading to the green light for this relatively new series. 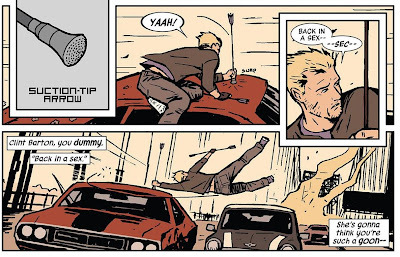 Nevertheless, the relatively low profile of the character undoubtedly has provided series writer Matt Fraction a blank slate and the freedom to play in this character's sandbox. With the current Hawkeye series, Fraction has created a compelling non-superhero superhero series. As a nod to the character’s non-marquee status, the book revels in Hawkeye as the unglamorous third wheel member of the Avengers superhero team. The character lives in a New York City walkup tenement (which he purchases early in the new series series, becoming its landlord) and in between his sporadic high-profile adventures, he spends much of the series dealing with local Eastern European toughs who are terrorizing his tenants, the various women and ex-girlfriends in his life, and life in general. Both the art and color palette in itself shows that this isn’t your typical comic-book series: one issue is told in a series of romance comics covers while a recent story was told from the point of view of a stray dog, using icons to reflect the dog’s point of view. At once innovative and groundbreaking as well as easily accessible (I can see this book having appeal to casual fans and women), the book has earned well-deserved plaudits. Hawkeye embodies the tone and approach I like to think Avengers’ director Joss Whedon is taking with his upcoming "Agents of SHIELD" television series which will focus on the behind-the-scenes supporting characters rather than the marquees. Based on the art, I picked up a recent issue of this recently re-booted title and, thanks to the ease of instantly ordering back issues of the series, decided to go back to the first issue of this new title. Though I have little knowledge of the circumstances or events that led to the launch of this new X-title, I have enjoyed the title in the moment and on its own terms, without the need to catch up on past exposition. Enough is given in the new series to understand what is going on. The writer, Michael Bendis, has become one of Marvel’s most popular writers and I can see why. 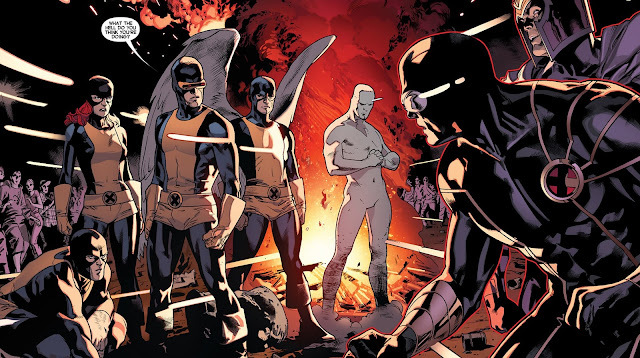 The X-Men has always been part adventure sci-fi / part soap opera, and Bendis has a gift for small dialogue touches that help define a character or relationship, or inject some humor to an otherwise serious moment when needed, while also spinning a fantastic but engaging yarn. One thing I will say about Marvel is that they’ve always been good at making the characters feel like they’re in the “real” world through setting and showing the social and political impact they would have if they really existed. 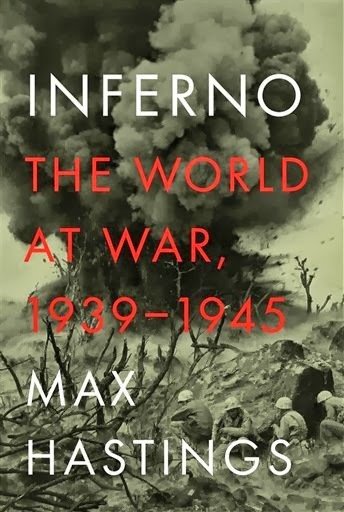 Altogether, that has made this new title for me a fun, compelling read. And just to show I haven’t completely abandoned DC, a fun new title is Batman ‘66, which is a special digital comic that is exclusive to Comixology in a tablet-friendly format and includes motion graphics. 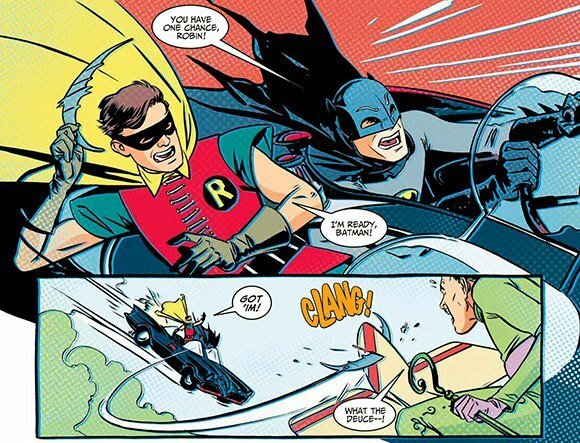 Written by Jeff Parker and drawn by fan-favorite Mike Allred, the series is basically the 1960s Batman television show (starring Adam West) in comic-book format. The series is fun and tongue-in-cheek, with great art that captures the likenesses of the actors and actresses who played the heroes and villains of the original show, as well as the vibe of the go-go ‘60s when the show was produced. I said earlier how a lot of DC’s comics seemed to have lost their sense of fun—this series more than makes up for that. About the title of this year's report: prior to this year’s Comic-Con, a senior editor at wired.com contacted me with a request to interview me on Preview Night, when the show opens for a few hours the Wednesday evening before the official start of the show. After the interview, he told me the story would post the next day and would send me the link. I never received the follow up email and didn’t see the story, but when I returned home I found the story at the website. I guess I can now precede any mention of my comic-book with “as featured on wired.com"! I can't imagine there's an event as large and logistically complex as the San Diego Comic-Con that is as smoothly run and well organized. 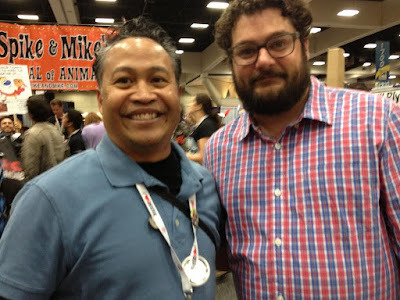 This year I had the opportunity to experience the show through the fresh eyes of friends of my brother (himself a longtime Comic-Con attendee), who were first-time attendees. They looked forward to their first Comic-Con with much anticipation and it was a pleasure to hear their reactions — they not only enjoyed themselves immensely, but their experience surpassed their wildest expectations. On the flip side, while strolling through the illustrators' booths on the far end of the floor, I overheard an older established artist, who described himself as “not a convention person,” tell a neighboring exhibitor that he found the show surprisingly fun and the fans exceedingly nice without any of the kind of “jerk fans” he said he sometimes encountered. So from the perspective of newbies — who said they quickly figured out how to navigate the show for maximum enjoyment — and a jaded professional at work behind a booth, the show was equally enjoyable. As usual, my view of the show was limited to my corner booth in the Small Press Area of Hall B2 on the main floor. I’ve noted in the past that my presence at Comic-Con makes me no more privy to any of the special announcements and surprise appearances that occur during the convention than non-attendees, usually requiring me to check the usual entertainment/blog sites for news and announcements coming out of the show. (Hey, the Man of Steel sequel is actually going to feature Superman and Batman! Tom Hiddleston made a surprise appearance in character as Loki in Hall H!) But quoting more wiser souls, Comic-Con is what you make it and exists as a giant tent for people of all stripes and interests, regardless of whether it’s comics, films, television, books, animation, art, gaming, cosplaying, and more, where you often get to see the creative artists and stars both on the floor and at panels and appearances. Given the difficulty of getting a ticket to the event, everyone who attended was simply happy to be there to follow their bliss, whether it was sitting all day in one of the infamous cavernous halls to ensure seeing a panel later in the day, walking around looking for comics old and new, or meeting their favorite artists. For years, Comic-Con-related programming both official and unofficial has gradually encompassed the surrounding local area, with companies taking over whole restaurants and storefronts during the entire show or for special events. The television show “Bates Motel” took over a storefront and parking lot, while the upcoming film, Ender’s Game, had a huge interactive tent across the street from the convention center. The videogame, "Assassin’s Creed," even had a full-size pirate ship docked in the marina behind the convention center! This year the show broadened its footprint even more, with some official Comic-Con business and events — like the pick-up of pre-ordered t-shirts — occurring off-site at neighboring hotels. The way most of the businesses in San Diego’s Gaslamp Quarter get into the spirit of Comic-Con reminded me that if the event moved to another city — as it nearly did last year when re-negotiating with the city — the show would lose a lot of the personality and character that San Diego gives it. Sales for me at this year’s show were solid and on par with past shows. In addition to the regular longtime readers who stopped by to pick up the newest issue, I met many new fans who purchased a starter pack or the entire series. 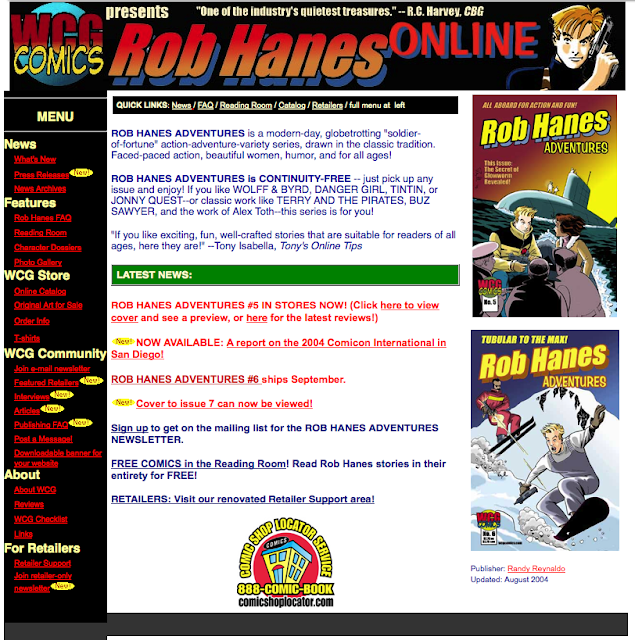 I’ve said this in past reports, but I can never tell what will compel someone to give Rob Hanes Adventures a try. 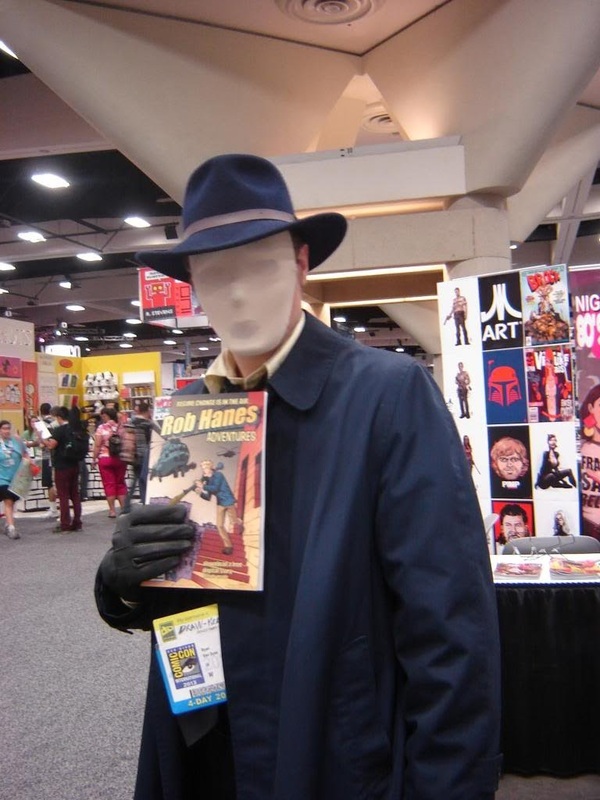 While some say they love the classic/retro feel of my book, others read all kinds of comics and are simply happy to find something new and different. Some are stopped by me and eventually agree to purchase a sample starter pack, while others seem to “get” the series right away, quickly purchasing the entire series with little persuasion. And as usual, I had quite a few people “rediscover” me after not having seen me for several years and happily catch up on missing issues. Overall, people seemed more prepared to spend money compared to past years (perhaps reflecting the improving economy). Interestingly, although I’ve had the ability to accept credit card payments on my mobile phone thanks to Square, this year a significant number of my sales were with plastic — so thanks, Square! As always, I appreciated the fellow pros who stopped by to say hi, including comics writer and blogger Tony Isabella, who as a guest of the show was attending his first Comic-Con in 10 years and who plugged my book during a podcast interview he gave during the show; cartoonist Scott McCloud; Wolff & Byrd writer-artist Batton Lash; and Usagi Yojimbo writer-artist Stan Sakai. Another great thrill was meeting Tom Batiuk, the cartoonist who created and draws Funky Winkerbean and Crankshaft. 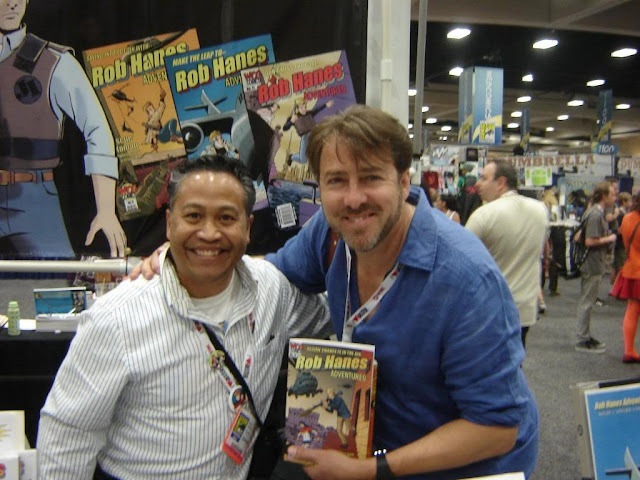 I not only had the opportunity to tell him that I grew up on his work, but I also learned he actually was familiar with Rob Hanes Adventures from way back! Spotting celebrities on the floor is also always something to watch out for at Comic-Con. Actor Tim Daly walked by my booth in casual conversation with a companion and, during most of the weekend, actor Sean Astin was signing at a booth all day just down the aisle from me. My family was thrilled to see Morgan Freeman on the floor and Grant Imahara from one of their favorite television shows, “Mythbusters.” A highlight for my children was the opportunity to see internet personalities Toby “Tobuscus” Turner and his partner, Gabe “Gabuscus” Buscus on a panel and, later, outside the convention hall where the children took pictures with them. Two such encounters were particularly memorable. The first was British talk show host Jonathan Ross (pictured at the top of this post), whose work I first discovered online before seeing him on BBC America. While strolling through the Small Press Area, he briefly stopped at my table to look at my work, smiled and moved on. (I've since discovered that he loves comics and, in fact, has written some.) A beat later, I recognized him and mentioned it to a friend. My friend disagreed but, because I was insistent, followed him down the aisle for a better look and perhaps a chance to hear his voice. A few moments later, I spotted Ross again walking down the aisle and, breaking all personal decorum, yelled “Jonathan!” Ross turned and, again breaking with my usual modesty, I waved him over and when he approached, I quietly asked, “Are you Jonathan Ross?” He actually seemed tickled to be recognized, said yes, and said he liked my work because it reminded him of the “ligne clair” of Hergé, the artist of Tintin. When I asked if we could take a picture together, he was delighted to do so. I rarely attend panels anymore, partly because I need to be at my table during the show. The larger halls, some of which seat up to 6,000 people, are of course a whole different animal, usually requiring a full-day commitment if one expects to get into a specific panel. The line usually starts literally the day before — with people camped out over night. One friend stayed in the room from 10:30 a.m. to 4:30 p.m. My family love hitting panels, though of course it takes advance planning. I did get out on the floor during breaks briefly once or twice a day. Though I tend to try and walk most of the floor during these times, I tend to focus on looking at the comics dealers with new comics and graphic novels for sale, original art dealers, and the artists booths. Much of my exploration of the convention floor, however, is done in the early hours before the show opens when it’s quiet and peaceful, though nothing is open or for sale yet. It is at these times I usually scope out what I'm interested in buying so that, during the show, I can go to the booth directly and swiftly make the purchase. Now that my children are getting a little older, there have been some opportunities to participate in a few after-hours activities. This year, for the first time ever, I attended with my family part of the masquerade ball, basically a costume contest, which has been a Comic-Con tradition for many, many years. It's quite a Comic-Con experience, partly because you're sharing the experience with so many fellow geeks. 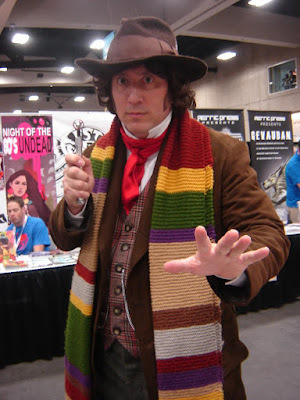 For some reason, the cosplaying didn't seem as impressive as in past years, though that may simply be the result of my being at the same location for much of the show. In fact, for the most part, the more subdued nature of the people in costume reflected the crowds and overall tone of the show for me. Given the scale of the show, it's surprisingly mellow and easy-going — even when the crowds were shoulder to shoulder. Not all the attendees are old hands like me and others, but it seems now to be an inherent part of the event's vibe that new attendees quickly pick up on. And that's a tribute both to the attendees and the organizers. 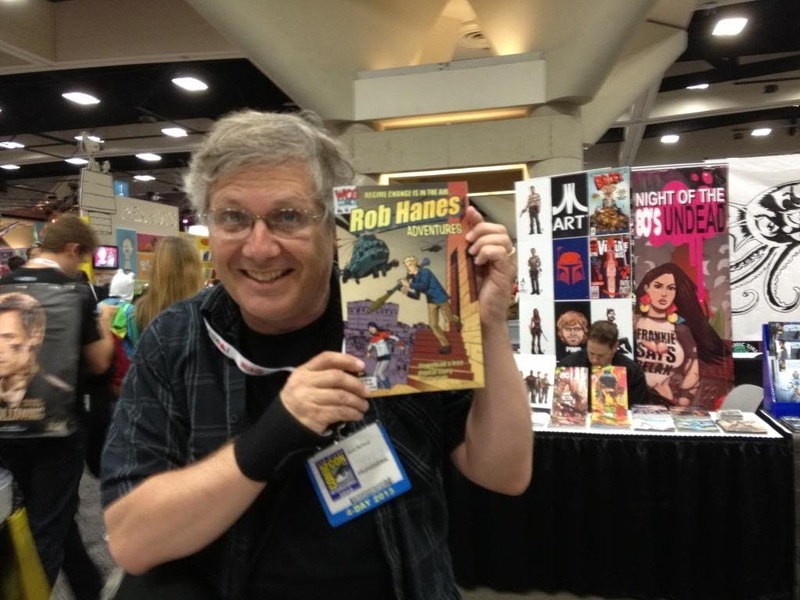 Below is a press release regarding my upcoming appearance at the 2013 San Diego Comic-Con. To see the official full release with all accompanying images, click here. WCG Comics will debut issue 14 of the long-running action-adventure series, Rob Hanes Adventures, at the 2013 San Diego Comic-Con. To pick up the issue, purchase back issues, and meet series writer-artist Randy Reynaldo, visit WCG Comics at Booth K1 in the Small Press Area, off aisle 1500 near the back of the hall in Lobby B2. T-shirts, original art, button pins, and freebies will also be available. Comic-Con is scheduled July 18-21, 2013 at the San Diego Convention Center. The show marks Reynaldo's 10th consecutive appearance at the San Diego Comic-Con — and 16th overall since 1993. As announced in the issue's solicitation in May, the series takes the title character to the (fictional) Middle East country of Koman where the CIA asks him to bodyguard an exiled princess in the hopes her presence and ties to the local insurgent coalition will spark the overthrow of Koman's military dictator, General Amra. Koman has been a recurring part of the series since its beginning in the 1990s, so the story closes the chapter on a long-running story arc. Entitled “Regime Change,” the story continues the series’ “ripped from the headlines” approach and was influenced in part by the tumultuous changes overtaking the Middle East. Inspired by classic adventure comic strips like Milton Caniff's Terry and the Pirates and Roy Crane's Buz Sawyer but set in the modern day — with dashes of light-hearted humor reminiscent of Will Eisner's Spirit — readers and fans have lauded Rob Hanes Adventures for recapturing the spirit of the classic adventure strip genre for modern day audiences. 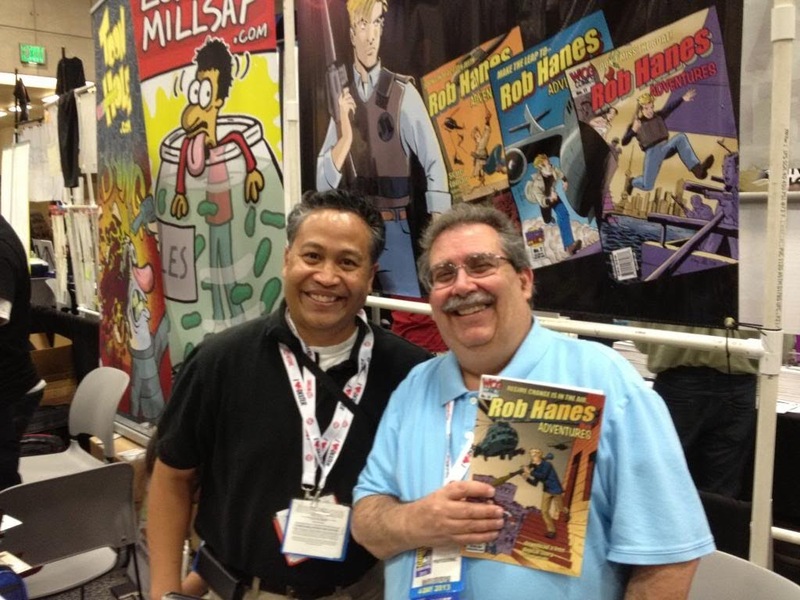 Though themes and characters recur in the series, every story of Rob Hanes Adventures is self-contained. The entire series remains in print, including 14 issues to date and two trade paperback collections of earlier work. For more information about the series, previews and to purchase back issues, visit the WCG Comics at wcgcomics.com. 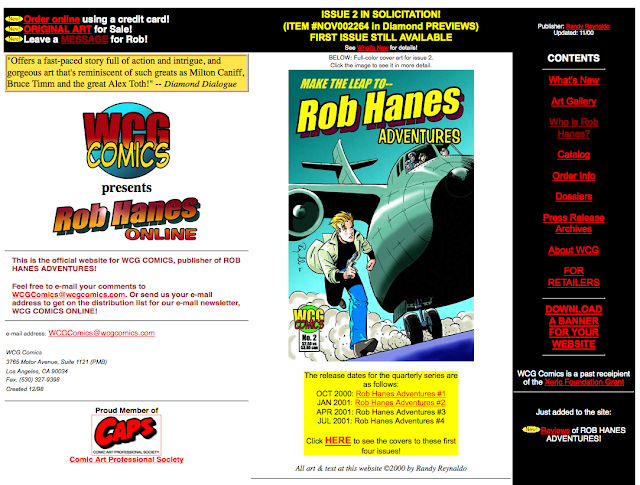 Click here for the original press release about Rob Hanes Adventures #14, which includes preview pages from the issue. 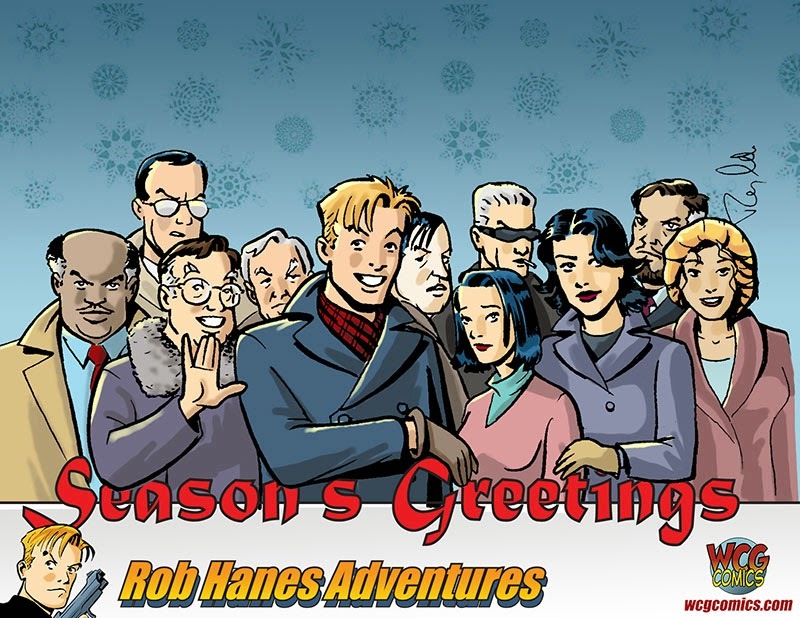 Or click here to go directly to a slideshow preview of Rob Hanes Adventures #14. For more information, visit the San Diego Comic-Con website. 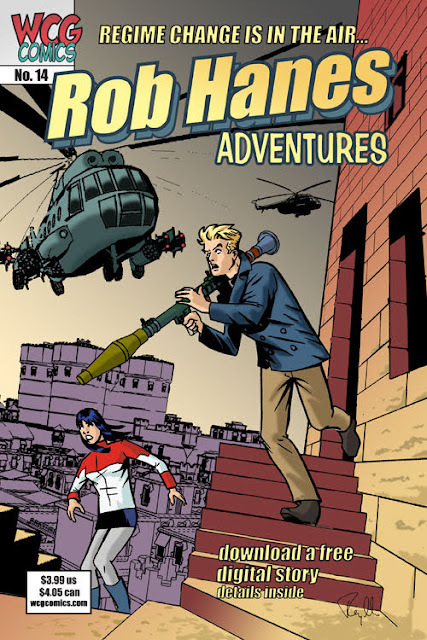 High adventure and real-life headlines collide again this July in the pages of Rob Hanes Adventures when issue 14 of the long-running indie action-adventure comic-book series finds international troubleshooter Rob Hanes the catalyst for an Arab Spring uprising in the Middle East. In “Regime Change,” globetrotting adventurer Rob Hanes is asked by the CIA to travel to the Middle East country of Koman as the bodyguard of a jet-setting member of the exiled royal family in the hope that her presence will lead to the coup of General Amra, the country’s military dictator. However, Rob soon finds his assignment complicated by a love triangle involving Amra, the princess, and the head of the insurgency. "Current events like the Arab Spring uprisings are really just a backdrop for telling an entertaining story full of old-fashioned adventure, romance and intrigue," said writer-artist Randy Reynaldo about the upcoming issue. "Real-world events have fueled many of Rob's adventures and the Middle East has been the setting of many stories in the series, so it was a natural fit to portray these events in a story,"
An advance preview of the series is available below, at the WCG Comics blog, and as a slideshow at WCG Comics' Facebook page. As with all stories in the series, the story is complete and self-contained. 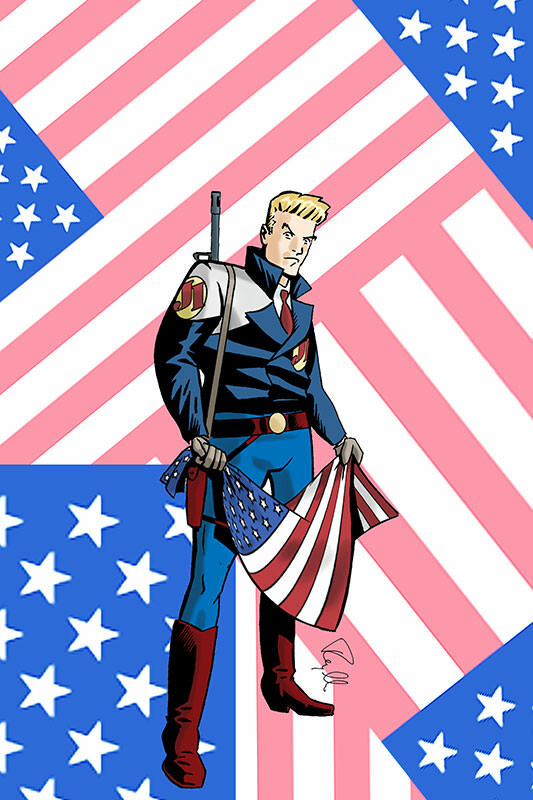 Inspired by classic adventure comics like Milton Caniff's Terry and the Pirates and Roy Crane's Buz Sawyer but set in the modern day—with dashes of light-hearted humor reminiscent of Will Eisner's Spirit—writer-artist Randy Reynaldo’s work on Rob Hanes Adventures remains a standard-bearer for breezy, fast paced action-adventure reminiscent of Indiana Jones and James Bond, and the work of cartoonists like Alex Toth. Debuting in 1991 as part of the era’s storied wave of small press black-and-white comics, the series has built a dedicated following for recapturing the spirit of the classic adventure strip genre for a modern day audience. The entire series remains in print, including 13 issues to date of Rob Hanes Adventures and two trade paperback collections of earlier work. For more information about the series, previews and to place an order, visit the WCG Comics at wcgcomics.com or on Facebook at http://www.facebook.com/rhadventures. 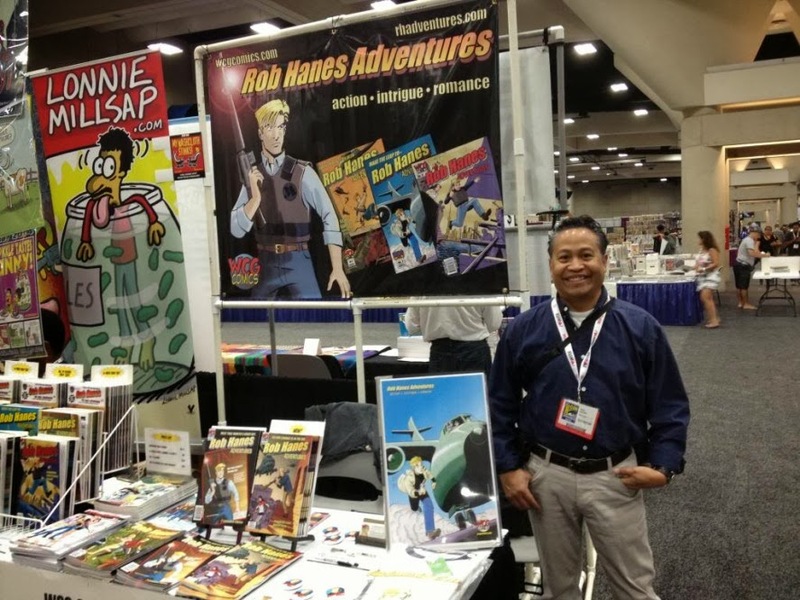 Over the years, Rob Hanes Adventures has been reviewed, spotlighted and featured in numerous respected comics industry news publications and websites. The series was also featured in Tony Isabella’s 1000 Comic Books You Must Read (Krause Publications, 2009).